The BBC reported that someone dumped about 1800 chicks in a field in Crowland, near Peterborough, in the United Kingdom. The chicks were killed because they were found close to an avian flu exclusion zone. But the British egg industry routinely kills millions of chicks per year. Males cannot lay eggs so they are usually gassed but may be “macerated,” or ground up. The RSPCA approves of both methods of killing the very same vulnerable creatures left to die in Crowland. And the RSPCA actively encourages people to eat chickens (and other animals). The answer is that it doesn’t. We express outrage about the chicks in Crowland, but, by virtue of being consumers of eggs, chickens, and other animals, we support practices that lead to the same conclusion: the very same vulnerable beings are killed. There are no two ways around it: our position is palpably confused. Is our conventional wisdom about our moral obligations to animals unable to provide greater clarity and moral guidance in such situations? First, we need to identify what our conventional wisdom about animals is. We would submit that it is encompassed in a simple, uncontroversial single principle: that it is wrong to inflict unnecessary suffering on animals. That is, most people believe that animals have some moral value but have less value than humans, so, in a conflict between humans and animals, animals lose. We need to think with a bit more clarity about what it is we say we believe. When is Harming Animals Necessary? What do we mean by our conventional wisdom, which says that we can use and kill animals when it is necessary to do so? What is the meaning of “necessary”? Whatever satisfies the criterion of necessity, what most certainly cannot satisfy it is pleasure, amusement, or convenience. That is, we need a real conflict between humans and animals—some sort of compulsion that necessitates our harming animals. If we interpret necessity to include situations where our supposed “conflict” is that we will be deprived of some pleasure or amusement, or we will be inconvenienced, then there is no limiting principle. Our conventional moral thinking about animals would be useless. This is why many people oppose purely sporting activities, such as bull fighting, dog fighting, and fox hunting. The problem is that our most numerically significant use of animals—for food—has no more claim of necessity than the use of animals for bullfighting. People used to believe that eating meat, dairy, and eggs was necessary for human health. But for many years now, the National Health Service, the British Nutrition Foundation, and the British Dietetic Association, as well as similar organizations in the United States and other countries, have maintained that a balanced vegan diet of vegetables, grains, fruits, and nuts, and foods made therefrom, is perfectly healthy. Increasingly, mainstream health professionals are claiming that animal foods are actually detrimental for human health. But that is beside the point. No one maintains that it is necessary to consume animal products. 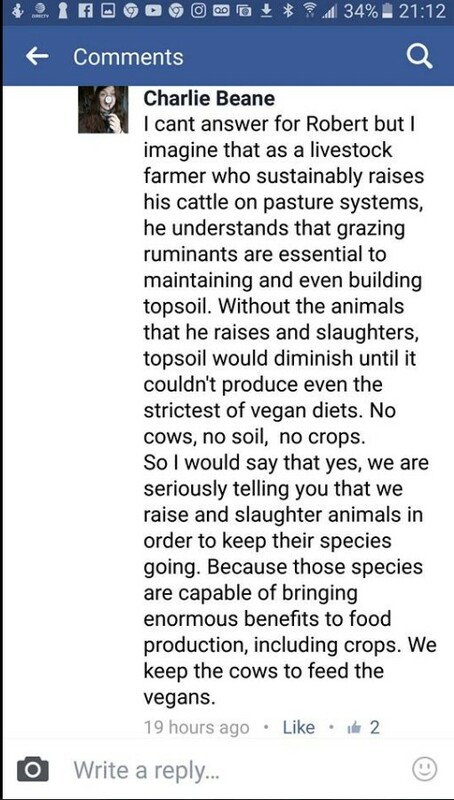 The best justification we have for killing 60 billion land animals, and an estimated one trillion sea animals, for food is that they taste good. Animal agriculture is not only morally problematic because it involves imposing unnecessary harm on animals, it is also an ecological disaster, responsible for pumping more greenhouse gases into the atmosphere than all of the burning of fossil fuels for transport, and for soil depletion, water pollution, deforestation, and a host of other ecological ills. If it is not necessary to kill and eat animals for food, then all of the suffering and death incidental to this use is, by definition, unnecessary. And our conventional wisdom must rule it out. Otherwise, our conventional wisdom means only that we should not impose more suffering than is necessary given uses that are wholly unnecessary in the first place. Surely, our conventional wisdom goes beyond prohibiting what is purely gratuitous harm to animals. The two of us promote the idea that animals have moral rights. But we recognize that most people do not agree with our position. However, it is not necessary to embrace an animal rights position to see where our conventional wisdom should lead: When we are starving on the desert island, or adrift in a lifeboat, there is necessity; there is compulsion. Conventional wisdom would hold that eating an animal in that circumstance is morally acceptable. If, however, we are not on a desert island or in a lifeboat, and there is no real necessity or compulsion to kill or to pay someone else to kill, our conventional wisdom should lead us to adopt a plant-based diet. The same moral outrage that leads us to reject the victimization of the chicks abandoned in Crowland should lead us to recognize that we should not be killing those very same vulnerable creatures as part of the egg industry. Animals are chattel property. It costs money to protect their interests. Animal exploiters, as rational actors, will generally protect animal interests to the extent that it is economically efficient to do so. That will, for the most part, result in very low standards of animal welfare. 1. Persuade government to impose higher standards–this is an option that will be opposed by industry and by many voters. It almost never works and when it does, it is almost always nothing more than a market correction. For example, in 1958, the U.S. government required that large animals be stunned before being slaughtered in order to reduce carcass damage and worker injuries. Industry went along because it was economically beneficial to do so. 2. Persuade industry that its present standards are not economically efficient and that adopting different standards would be economically beneficial. In recent years, animal welfare groups have been pursuing this approach. For example, PETA and HSUS promote the “controlled-atmosphere killing” (gassing) of poultry on the ground that it will be a more economically efficient way to process chicken. This approach puts “animal advocates” in the role of working with industry to identify inefficiencies in institutionalized exploitation. 3. Develop niche markets where more affluent people will pay a higher price for supposedly more “happy” products. This is the “happy exploitation” approach. There are two primary reasons why some consumers will pay more for “happy” products. First, they feel better about consuming animals if they can convince themselves they are consuming “compassionately”–and “animal advocates” will be happy to pat them on the back and encourage their “compassionate” consumption as they ask for a donation. Second, many consumers feel that “happy” products are better tasting and more healthful. Those who promote this third approach claim that their business is not about business at all. They often portray “happy exploitation” as morally sound and environmentally beneficial. But, as I have explained before, that is nonsense. It’s about business. It’s about speciesism. It’s about injustice. I recently encountered an excellent example of a “happy” exploitation producer that illustrates the problems. 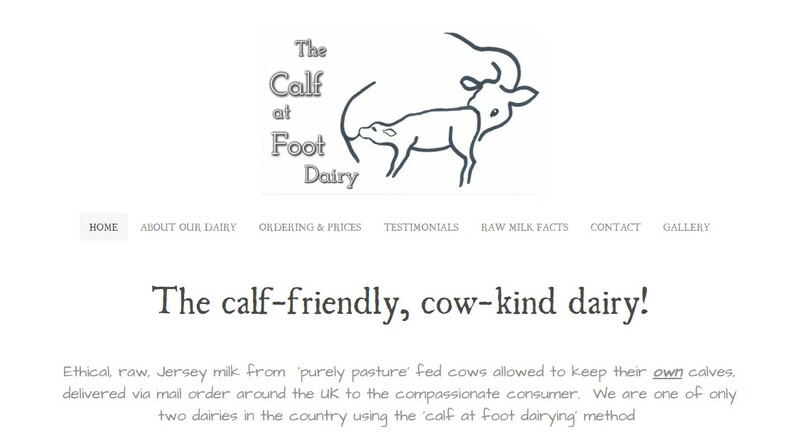 The Calf at Foot Dairy is located in Suffolk, England. But, alas, it’s not as it seems. 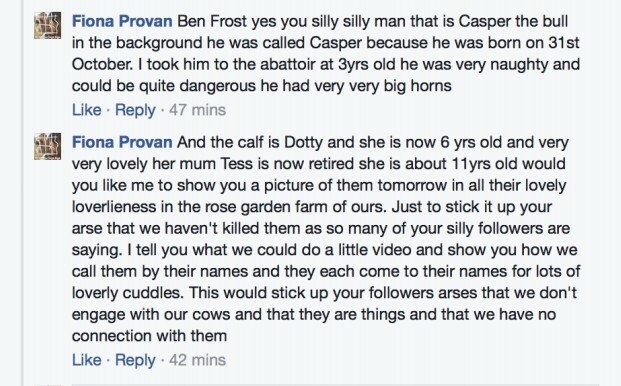 In a Facebook exchange, the owner of the dairy, Fiona Provan, said that she takes “the boys” to the slaughterhouse at about 2 years of age. She sells them as her special brand of beef. What? 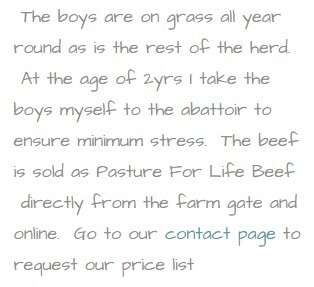 “The boys” are slaughtered at age 2? But how is that consistent with saying that the “cows are allowed to keep their calves?” I was puzzled. I inquired. Fiona told me that when they’re slaughtered at age 2, they’re not calves any more. They’re bulls. 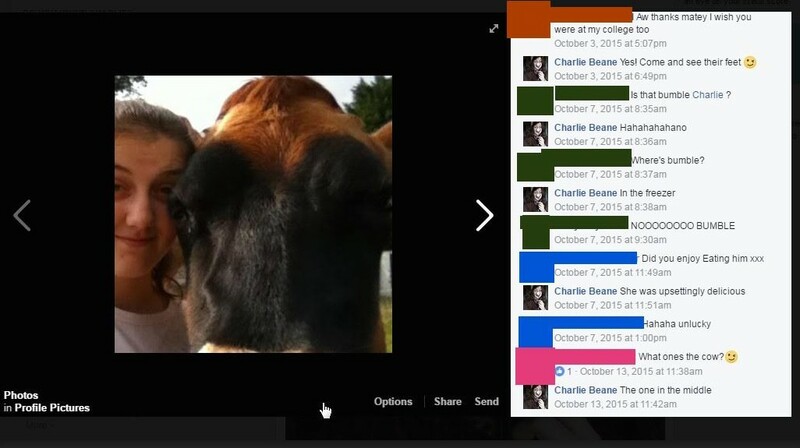 So if they were killed at “about a year old,” were they still “calves”? Or were they “pre-bulls”? I was confused. But Fiona clarified it. It seems that she was upset because she was “under attack from some very hostile vegans.” She made a mistake and she reiterated that she didn’t kill “the boys” until they were 2. Fiona keeps the male calves, or whatever you personally choose to call them, with the cows for the first 12 months. She kills them for beef at 2 years. Okay, so let’s recap: “Cows are allowed to keep their calves” means that cows stay with their calves for a year and then they are separated and the males are killed at age 2. Fiona takes them to the slaughterhouse herself because she is concerned about their welfare. That’s certainly interesting. I have to admit that I would never have gotten that from the statement “cows are allowed to keep their calves.” But that’s apparently a result of my limitation in understanding the subtleties of the English language. It’s obvious that the statement by Provan that “cows are allowed to keep their calves” is intended as chloroform to anaesthetise customers into a sense of false security regarding the morality of their purchases on a “don’t ask, don’t tell” basis. Vendor and customer alike get to carry on exploiting while telling themselves, and reflecting back to each other, that they are doing the right thing. It’s only when those pesky abolitionists come along and ask inconvenient questions that the bubble is punctured and the lies are exposed. And the more Fiona and her fellow “happy” exploitation farmers talk to try to justify what they do, the bigger the hole they dig for themselves, confirming most graphically our critique of the morally bankrupt nature of welfarism. An “Attack” or a Challenge? Fiona, I have a simple question. If, as is clearly the case, humans do not need milk or meat for nutritional reasons, how can we justify exploiting nonhumans for milk or meat? In doing so, we are engaging in the imposition of unnecessary suffering and death, which is clearly morally wrong. You don’t even need a rights approach to see the problem here—the imposition of suffering and death is gratuitous if the only justification is palate pleasure or habit. What are your thoughts here? I never got an answer because she blocked me after I posted this. I come from a vegan perspective but I know the planet cannot sustain a population of vegans. But I guess that is to be expected given that Fiona sees veganism as a threat to the planet. She apparently sees every non-vegan as an ecological warrior. I must confess that this was all news to me. I wondered what scientific genius has discovered what everyone else had missed. So I went to the Calf at Foot Facebook page (I had already been blocked from Fiona’s page), and I saw a number of references to someone named named Allan Savory, who holds a bachelor’s degree in botany and biology and was a former Rhodesian game officer and soldier who claims, based on a paucity of evidence, that we will save the world by eating more meat, and who compares himself to Galileo. To maintain that animal agriculture will save the earth and that the planet could never support widespread veganism is akin to belief that the earth is flat. 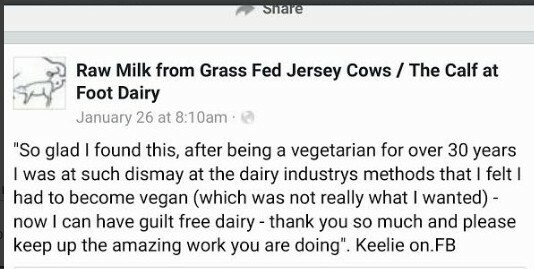 The whole point is we disassociate ourselves from the conventional dairies this is the whole point in setting up The Calf at Foot Dairy to show the animals do not have to be treated as units or commodities but if treated as sentient beings they produce better quality stuff for us to eat. In other words, Fiona is serving a market. And her supposedly better treatment of the animals makes for a better product that she can sell to the market of affluent altruists who are willing to pay more in order to feel comfortable about continuing to consume animal products. Fiona thinks that she’s not treating animals as commodities but that is patently wrong and betrayed by her own words: they are just commodities in a different business–the business of “happy exploitation.” She treats them better and they produce “better quality stuff.” This is certainly not a recognition that animals have inherent moral; they are still being treated as commodities and producers of commodities. They are still things. I disagree. I think that it is profoundly sad that anyone sees betraying trust as something morally good. http://www.abolitionistapproach.com/wp-content/uploads/2015/09/aa_logo.png 0 0 Gary L. Francione http://www.abolitionistapproach.com/wp-content/uploads/2015/09/aa_logo.png Gary L. Francione2017-02-07 14:09:372017-02-09 07:13:17The Calf at Foot Dairy and Happy Exploitation: "They produce better quality stuff for us to eat."